Matt Keifer, MD, MPH, Co-Director/Project Director, and Amy Liebman, MPA, MA, Co-Project Director with UMASH were both involved in the 2013 EPA publication Recognition and Management of Pesticide Poisonings, 6th Edition. “It’s an honor to be even a small part of such a distinguished and valuable collection of information on the management and identification of pesticide health effects” said Dr. Keifer. 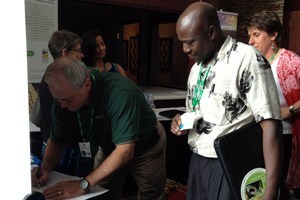 In the photo, Matt and Amy are pictured signing a copy of the publication during the International Society for Agricultural Safety and Health (ISASH) annual conference in Sandusky, Ohio in June 2013. To read the document, look for Roberts, JR, & Reigart, JR (2013). Recognition and Management of Pesticide Poisonings, 6th Edition, [online]. It is available at: http://www2.epa.gov/pesticide-worker-safety/recognition-and-management-pesticide-poisonings.